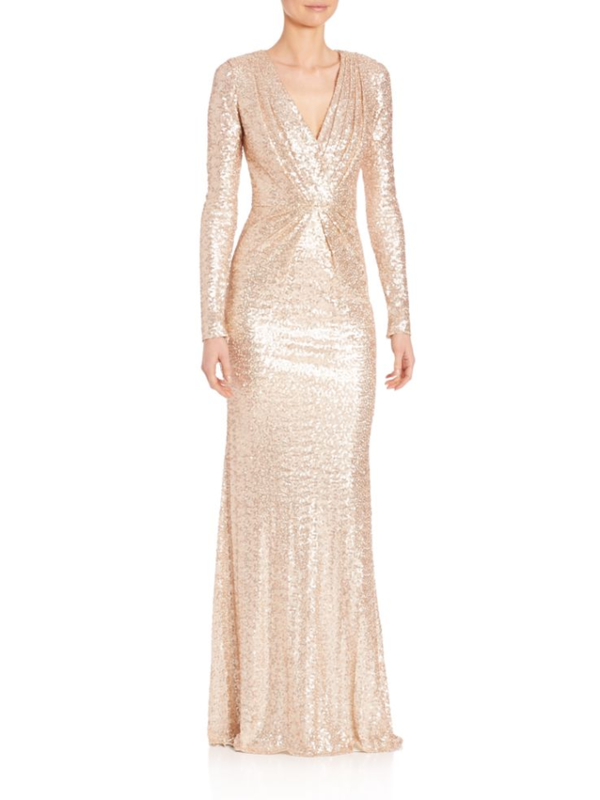 Champagne Mother of the Bride dress ideas and shopping sources in this post use affiliate links where noted in italics. 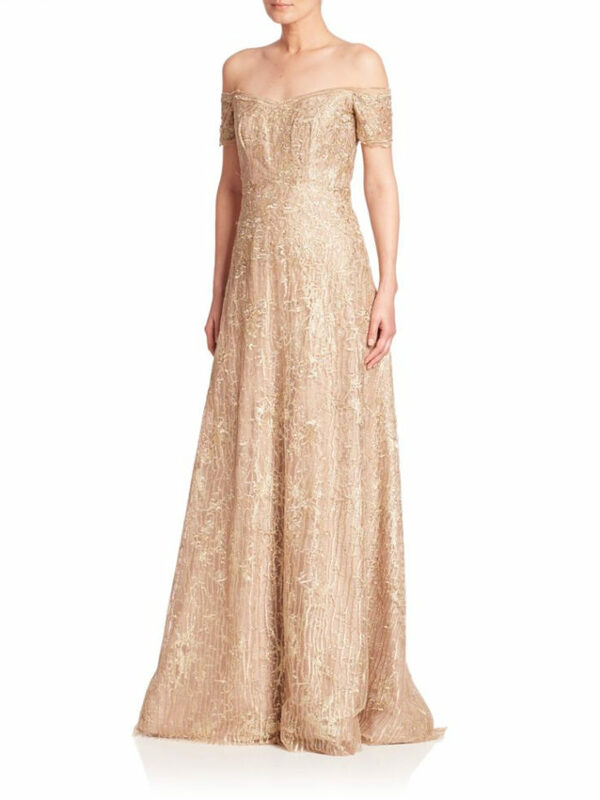 While champagne, gold, and neutral gowns have long been an accepted and often encouraged color for Mother-of-the-Bride and Mother of the Groom dresses, and I agree that they are almost always a suitable choice. 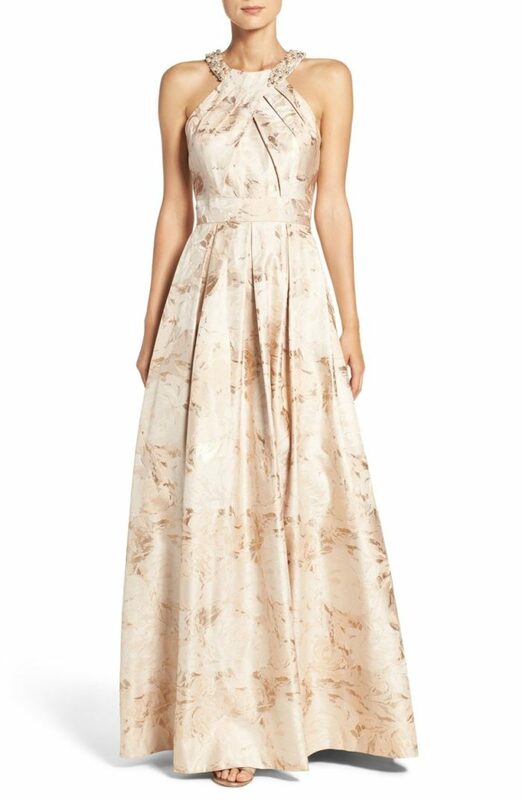 But sometimes there are exceptions. 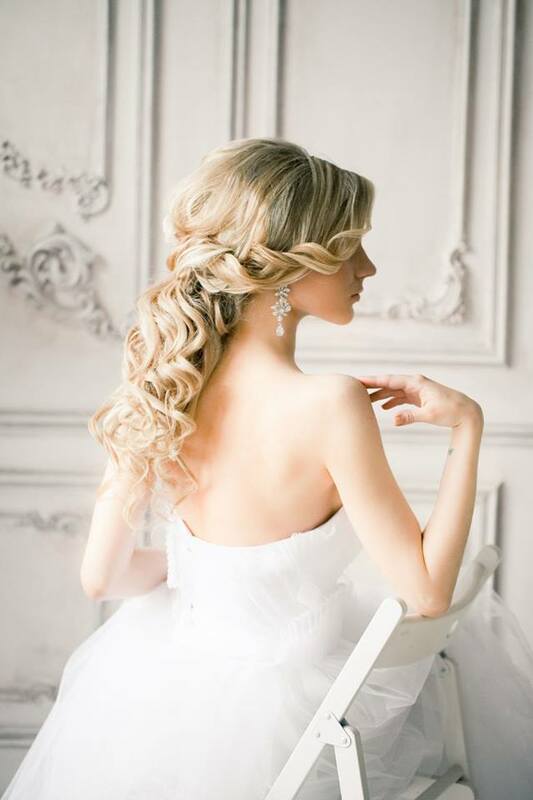 In this case, the bride’s gown was going to be a neutral color – which is a Wedding Dress color trend that is happening more and more often! 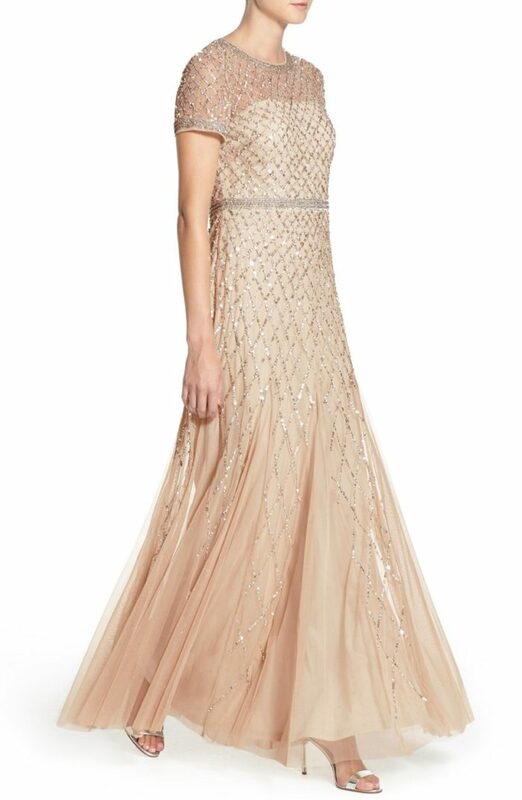 We frequently bridal gowns offered in pale blush, shades of beige, deep ivory, and sometimes gold, so in these cases, having mothers of the bride/grooms wearing the same colors can be tricky! 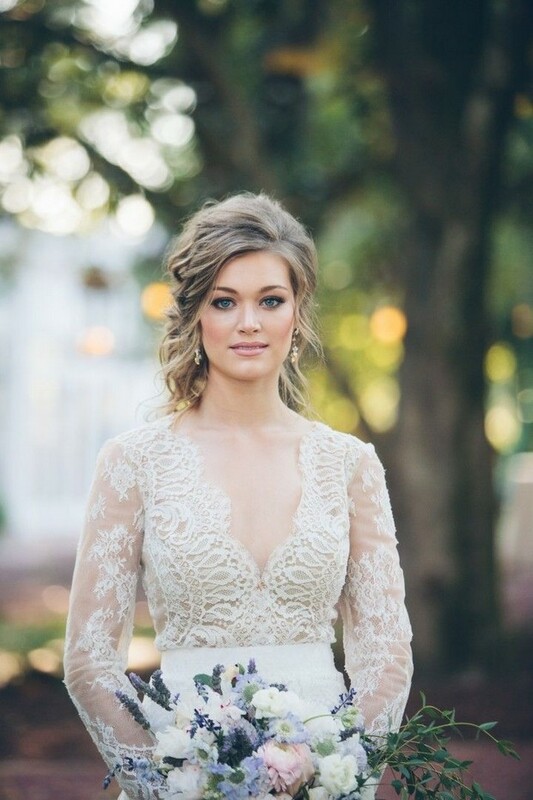 If a champagne gown might too closely mimic the bride’s gown own ivory or neutral gown, or the bride feels uncomfortable with this color for anyone else in the wedding might not be the best choice. 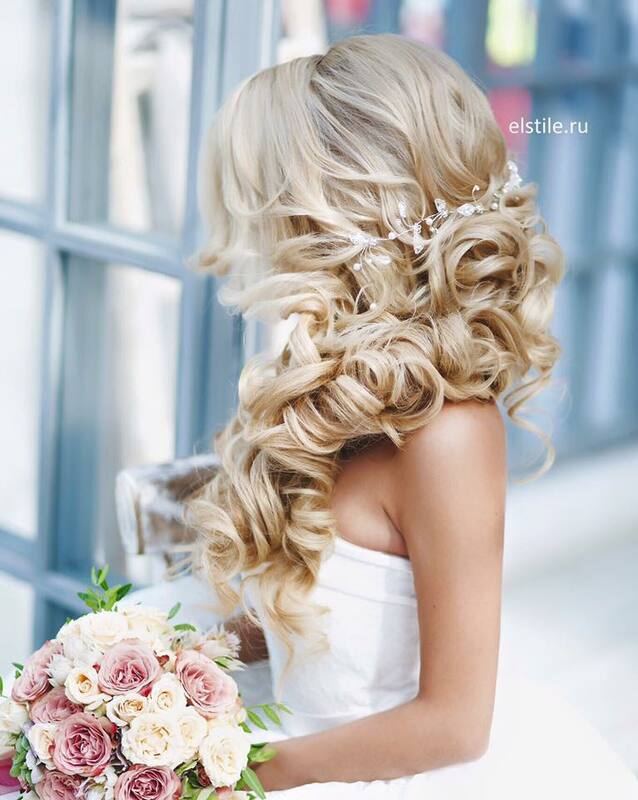 However, that’s really a very special case. 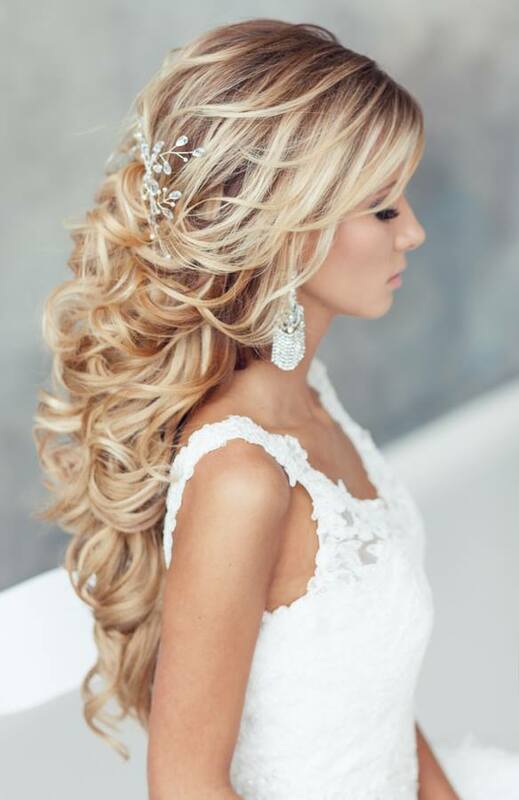 In all other cases, I say go for it! 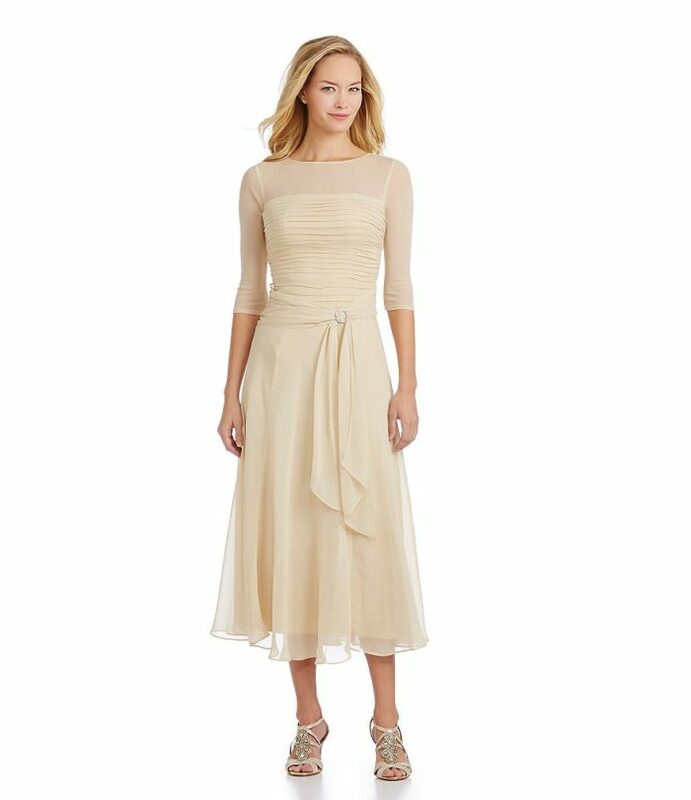 In most other scenarios when the bride or brides are wearing ivory, white or another near-champagne color, a champagne, taupe, or gold gown for the mothers in the wedding is the perfect choice. 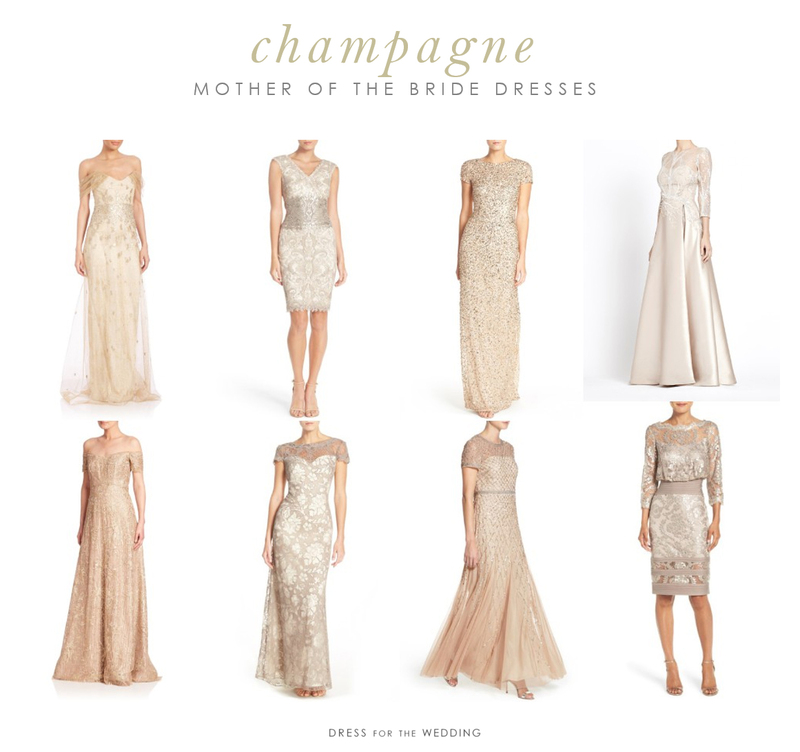 Champagne comes in a range from light beige to a deeper taupe or gold, so it’s easy to select one that would never be confused for a bridal gown. 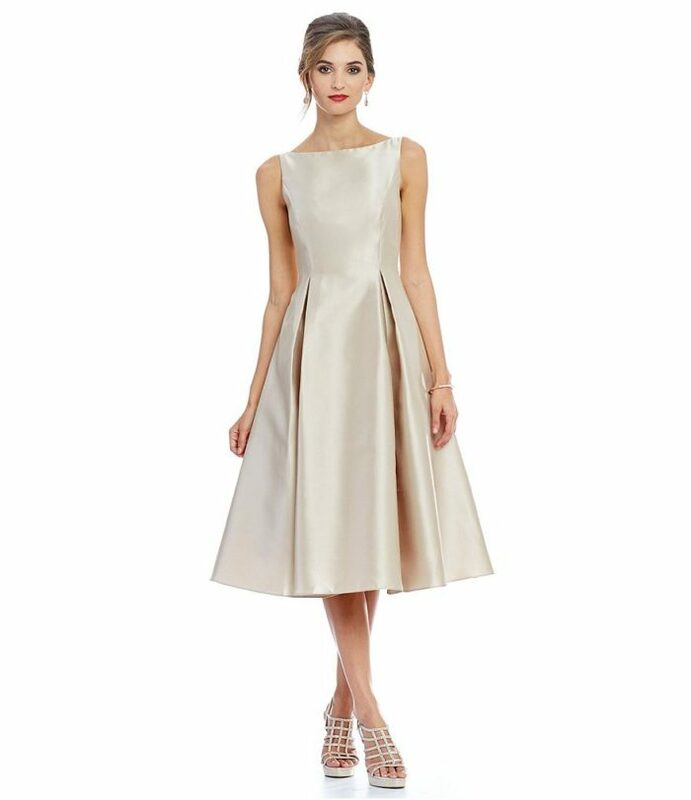 A champagne colored dress for mothers is a wonderful choice because this shade goes with a range of colors, works in nearly any season, and is always an elegant selection! 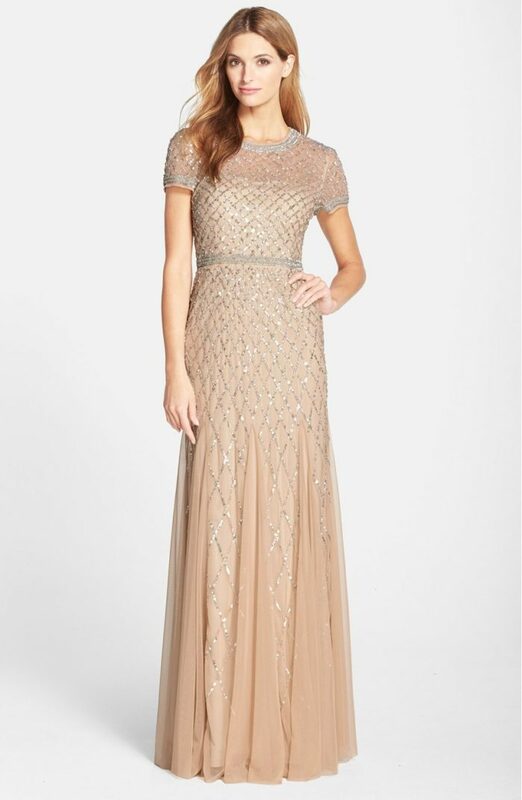 To help you in your dress search, I’ve compiled more than 20 dresses I think would suit Mothers of Brides/Grooms, in both in short cocktail lengths and longer formal styles. 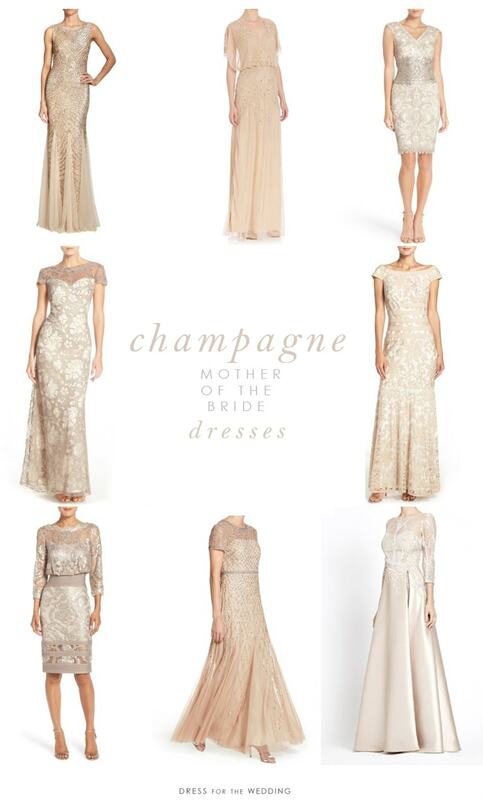 Wondering how to pick the right champagne gown? 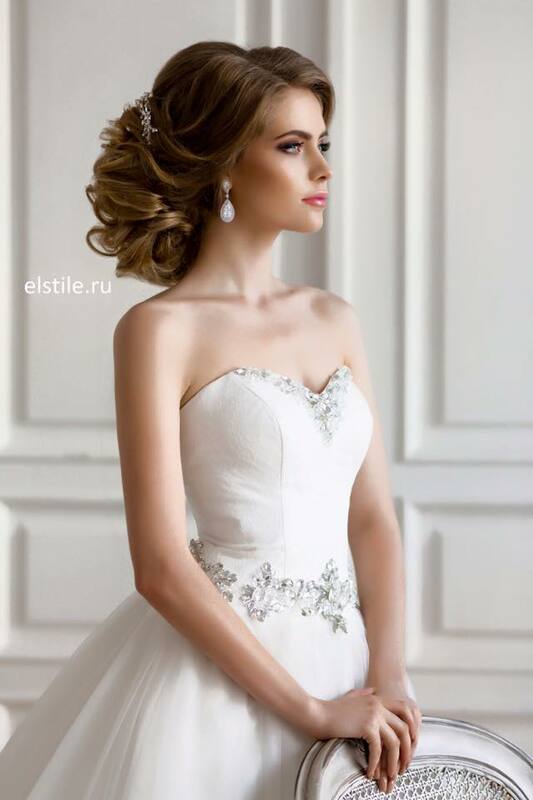 In general, any styles and color choices in the mothers dresses or gowns should be after discussion about the color scheme, and chosen in consultation with the couple, as well with communication between the mothers on both sides of the aisle about what they intend to wear. 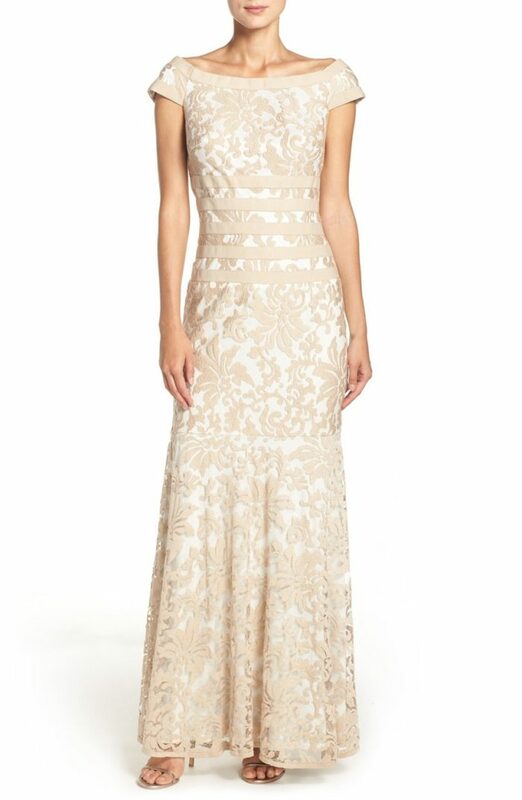 ( Usually, the Mother of the Bride chooses a color and style first.) 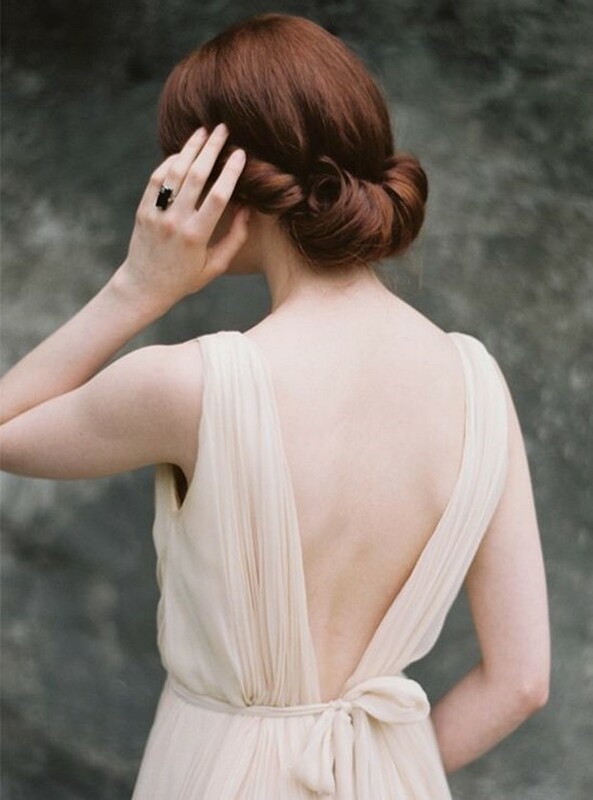 Other than that, it’s just a matter of silhouette and style, and level of formality.  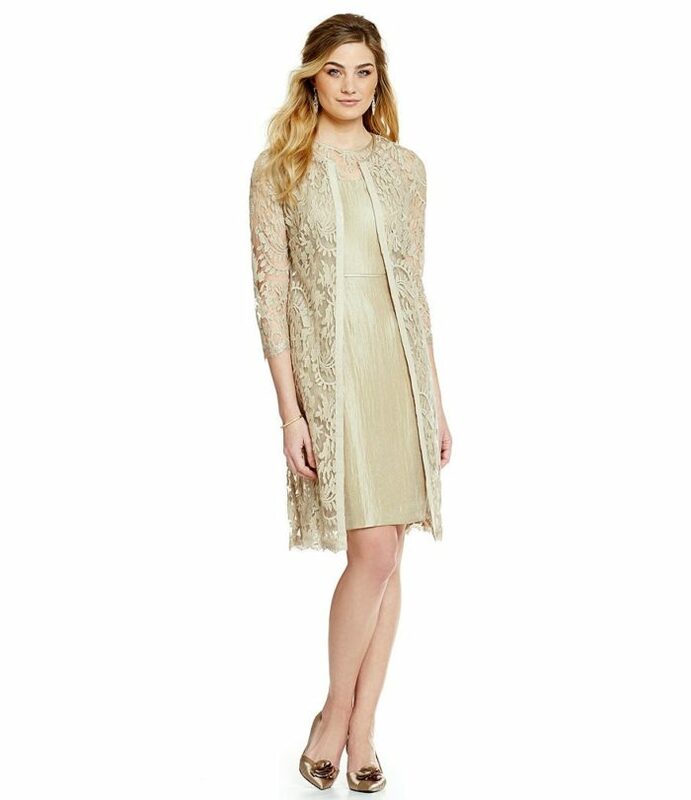 I’ve found a range that I think you’ll love! 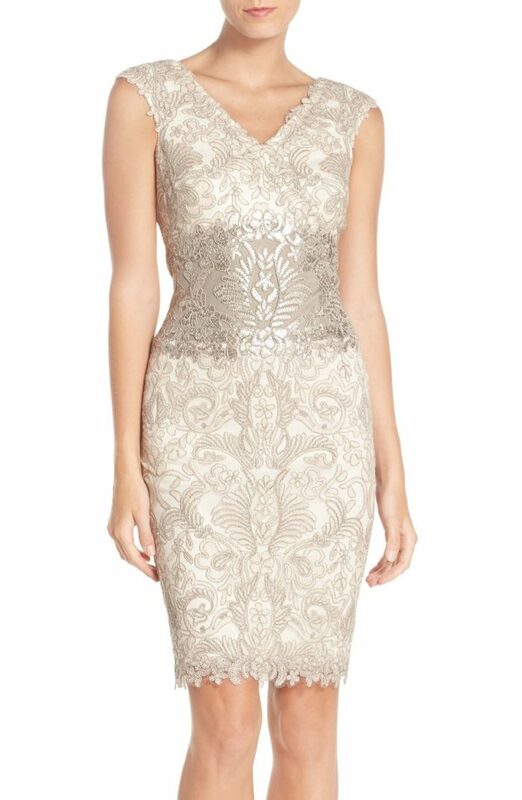 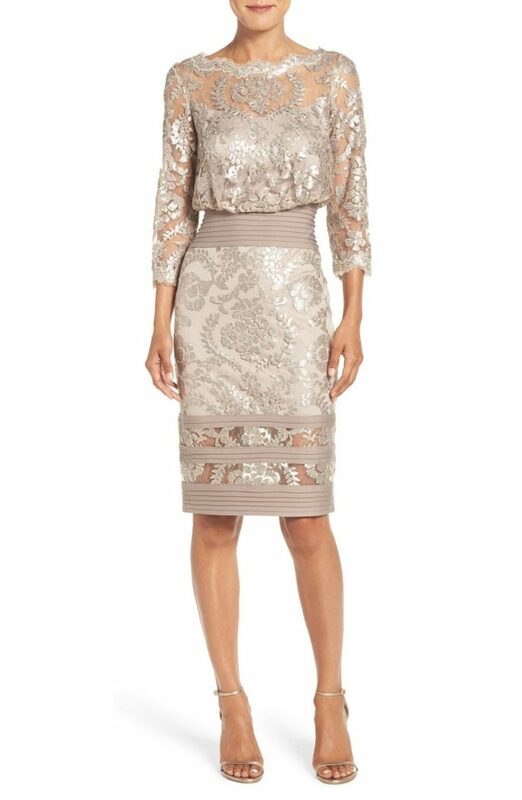 Tadashi Shoji has so many pretty styles like this Sequin Lace Sheath Dress from Nordstrom. 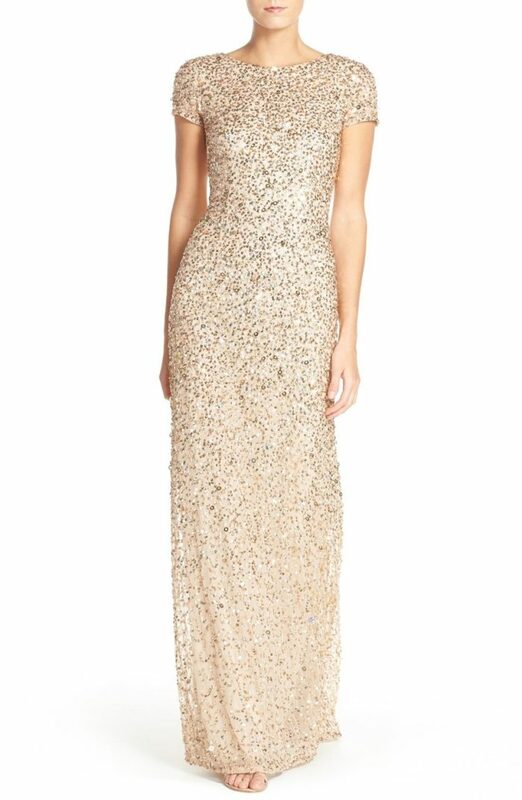 Sangria Shirred Illusion Gown in Champagne from Dillards. 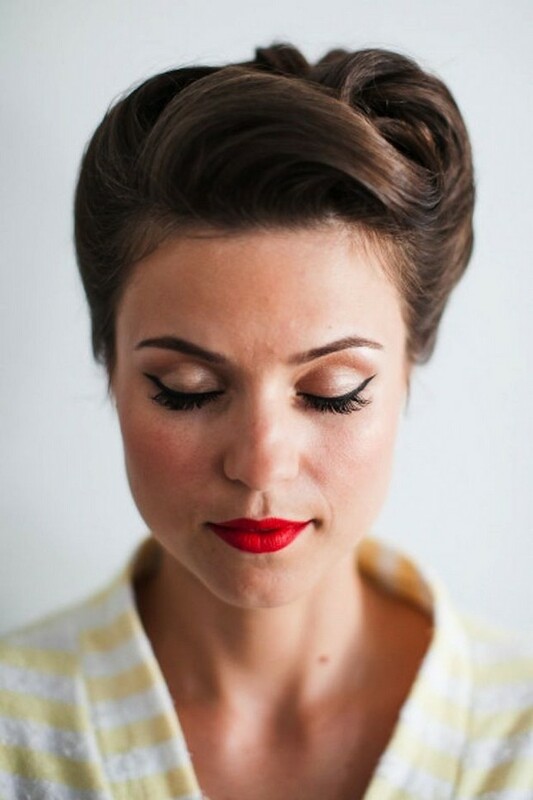 If you’re on the hunt for a wedding hairstyle that says ‘Vintage Vixen’ but still lets you look like yourself, look no further than these 16 seriously chic, vintage-inspired wedding hairstyles. 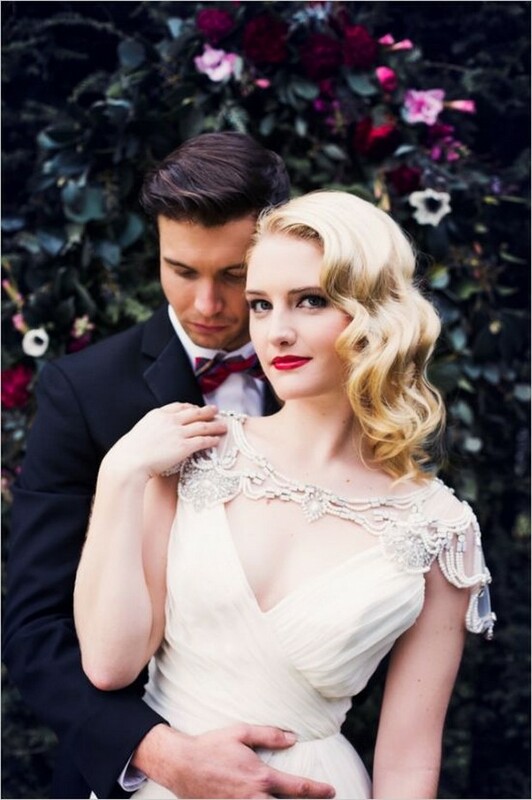 From 20s style pin curls and sensational 60s chignons to retro 50s rolls, vintage hairstyles come in all shapes and sizes and there’s the perfect one for every bride. 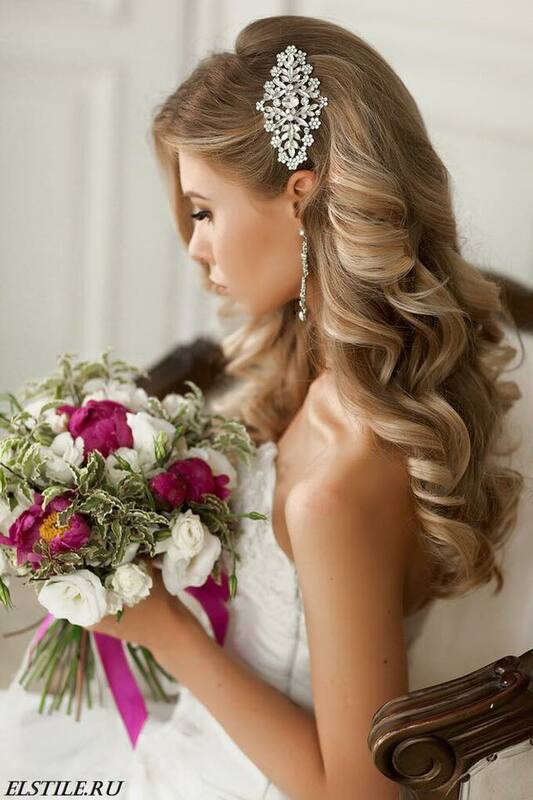 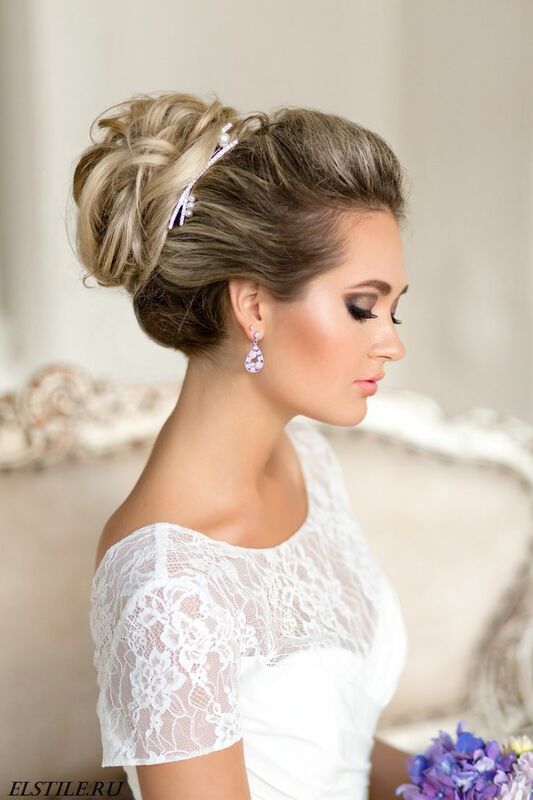 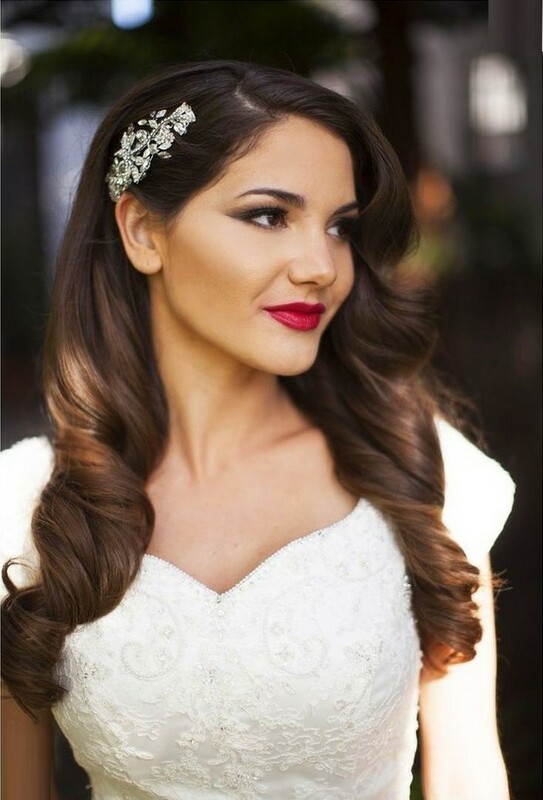 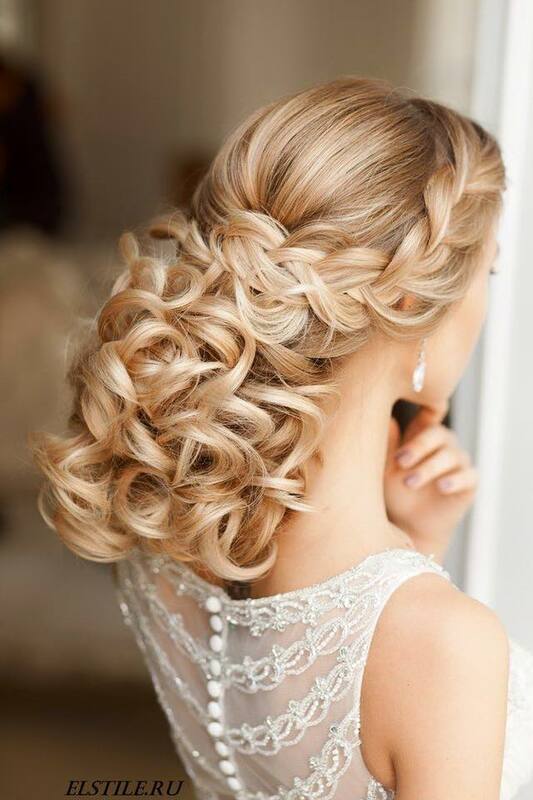 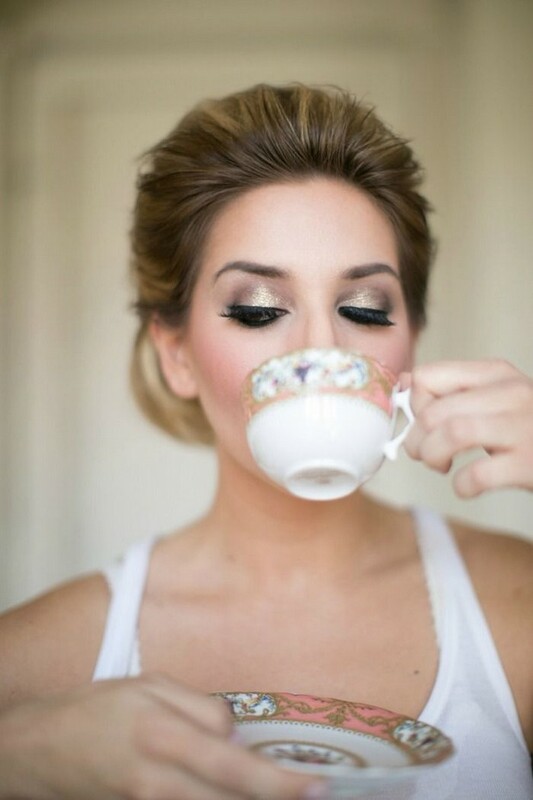 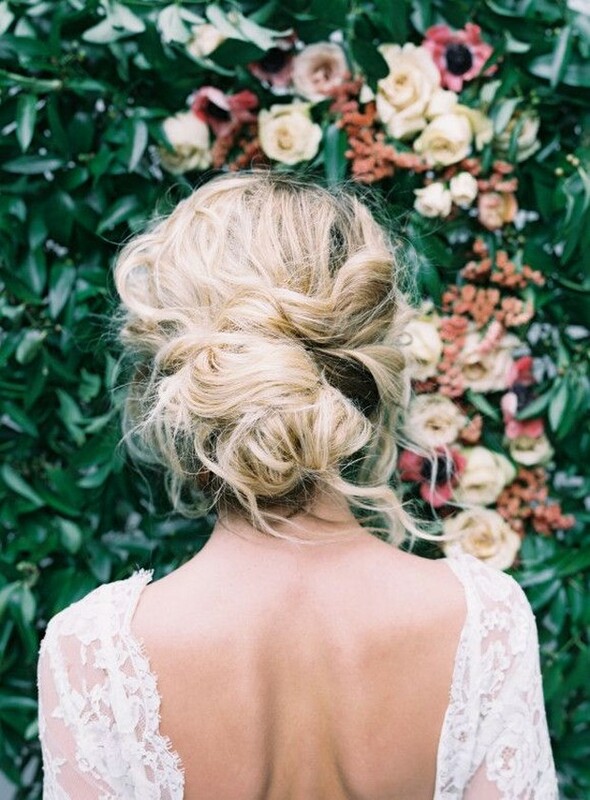 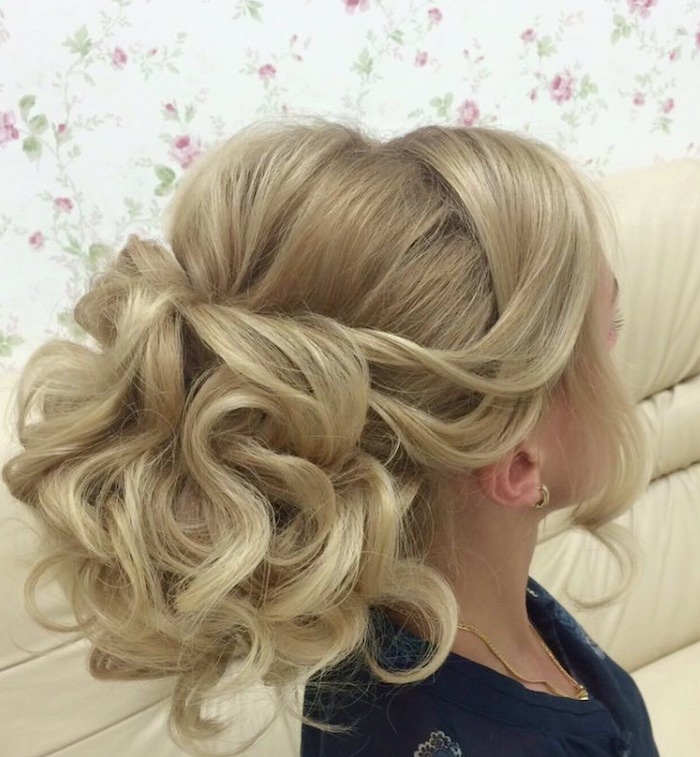 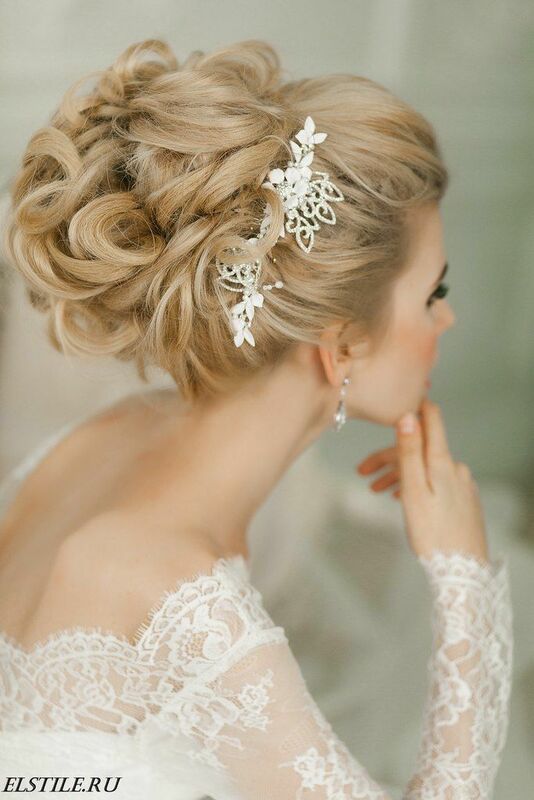 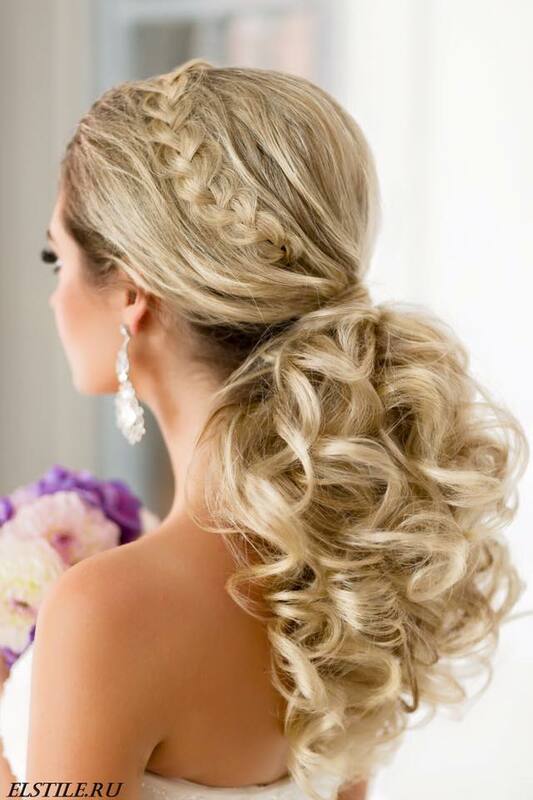 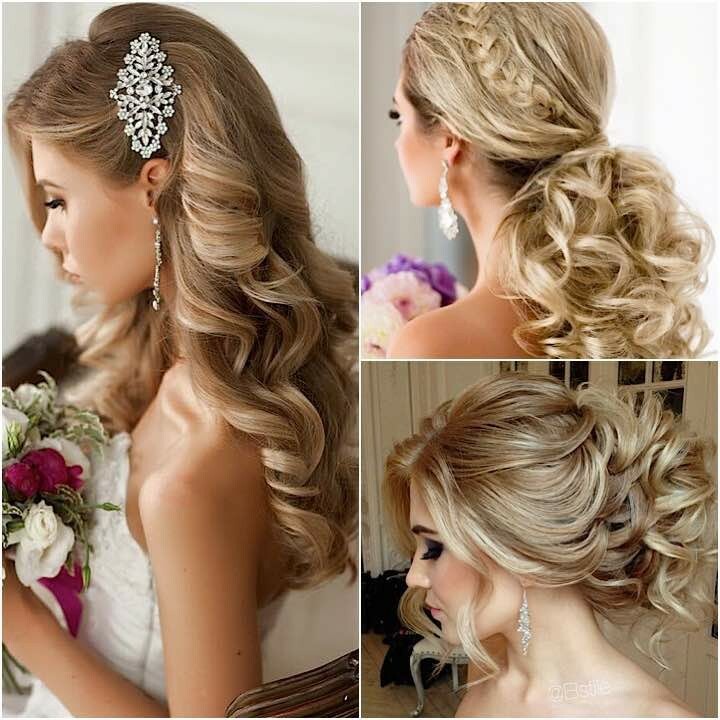 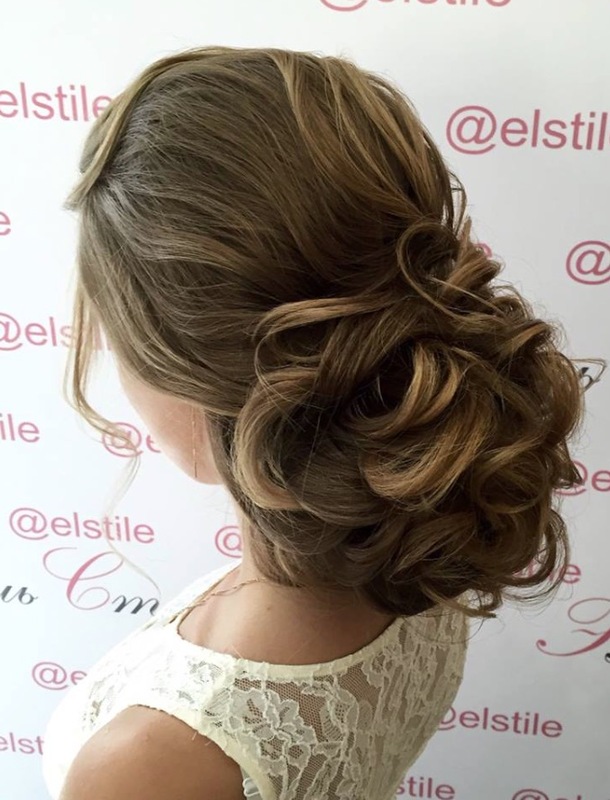 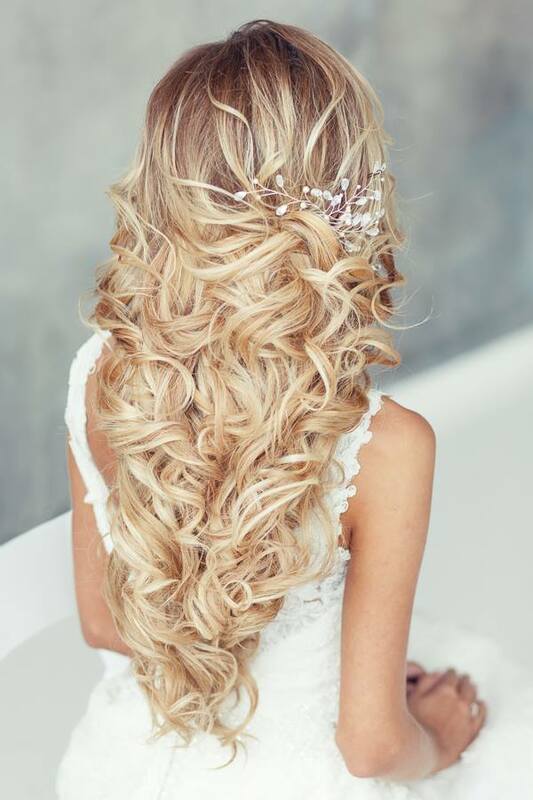 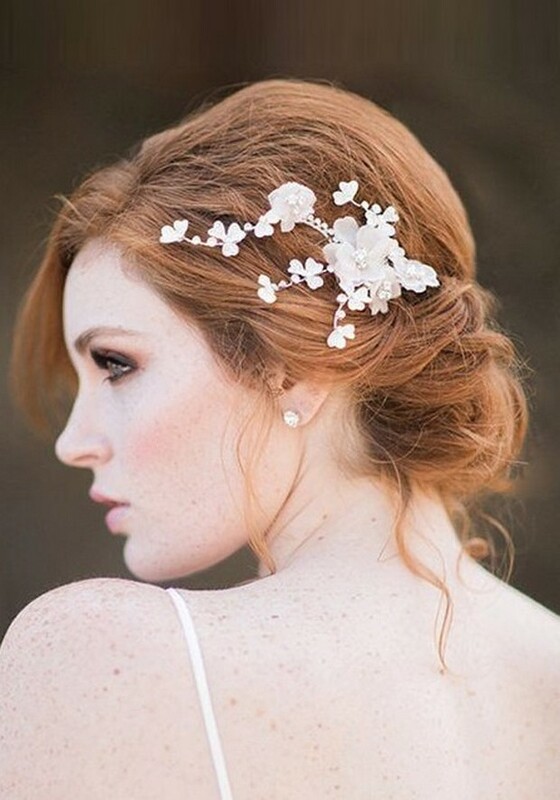 Remember we host some of the most incredible wedding hair stylists in the business here on Trubridal so make sure you jump on over to our comprehensive supplier directory as soon as you’ve found a gorge style to trial!